Was there an ice age? In most public schools, students are taught that there have been at least five major ice ages in Earth’s multi-billion-year history. The last one is claimed to have started 2.58 million years ago, and then retreated about 10,000 years ago. Obviously, this timescale is incompatible with biblical history. Nonetheless, there is scientific evidence for one ice age that occurred within the biblical timescale. The real ice age occurred shortly after the global flood and lasted a few hundred years. What is an ice age? Many people have the misconception that an ice age is simply a cold Earth – that the Earth’s global temperatures were below what they are today. But merely turning down Earth’s temperature does not result in an ice age; it merely results in a cold Earth. To have an ice age, we need ice: glaciers. Today, about ten percent of the Earth’s land is covered by glaciers. During the ice age, about thirty percent of Earth’s land was covered by glaciers. So, the Earth was not a frozen snowball during the ice age. Sections of the Earth were tropical at the time. The ice age simply reflects a time when the Earth had more ice, covering about three times as much of the land as we have today. There is compelling evidence for an ice age. Glacial striations are scratches that occur on certain rocky outcrops and indicate glacial motion. These striations were caused by rocks and pebbles embedded in the underside of a glacier as it moved over the outcrop. Glacial striations occur in parts of the world that today are not covered by glaciers. So we know that glaciers were much more extensive in the past. When glaciers melt, they deposit the rocks and other debris that were frozen within. This is called a glacial till. The material found within a glacial till can be traced to its uphill source since glaciers slide downhill over time. Of course, rapidly moving water can also deposit rocks and pebbles. But deposits left by water are well-sorted; larger, heavier rocks will fall out of suspension in water before smaller, lighter ones. However, the rocks deposited by a glacier are unsorted. From glacial striations and glacial tills, we can know approximately where the glaciers were during the peak of the ice age. At that time, glaciers covered most of Canada, down through the central United States, including New York, and Washington State. In Europe, glaciers covered Germany, Ireland, Scandinavia, and western Russia. But what caused the ice age? What ended it? Interestingly, secular scientists do not have a self-consistent answer to those questions. Many people have the impression that a reduction in Earth’s global temperature would naturally result in an ice age. But it won’t. 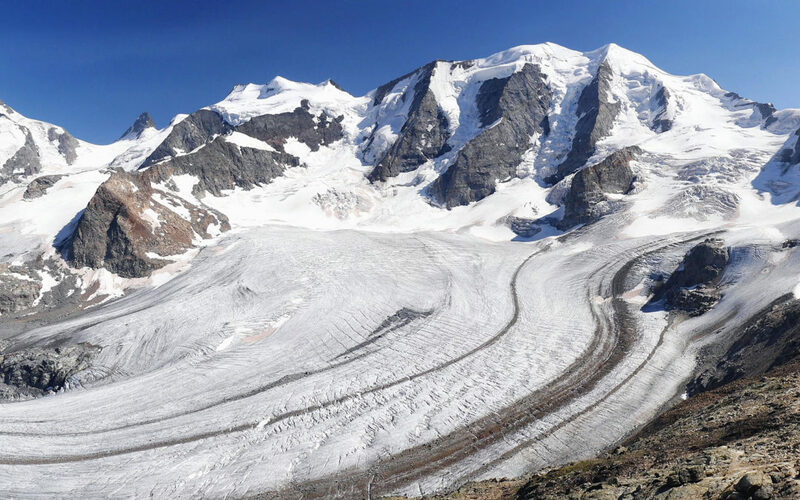 During the ice age, the glaciers were three times more extensive than they are today. But lowering Earth’s temperature will not do this. A cold Earth would have cold oceans, which do not evaporate efficiently, and cold air cannot hold much moisture. This would tend to result in less snowfall, and therefore fewer glaciers. And of course, an increase in Earth’s temperature will not result in an ice age either, because it will tend to result in the melting of glaciers that already exist. Most secular scientists invoke the Milankovitch theory to explain the ice age. This theory involves the gradual changes in the shape of Earth’s orbit around the sun in conjunction with the precession of Earth’s rotation axis. This supposedly results in various parts of the Earth receiving either more or less sunlight, thereby affecting the temperature. However, it does not adequately resolve the aforementioned difficulty – that a reduction in temperature does not result in more ice. Moreover, the Milankovitch theory is internally inconsistent since it relies on two contradictory dates for a given core sample. The problem remains. What physical mechanism could result in the Earth having glaciers three times more extensive than today? First, we require increased snowfall so the glaciers can build up over time. Second, we require mild seasons: relatively cool summers are needed so that the ice doesn’t melt as much, and relatively warm winters are needed since warm air holds more moisture than cold air, thereby allowing more snowfall. Warm oceans and cooler continents would be ideal for the formation of glaciers. Warm ocean water evaporates readily, and when the moist air moves over cooler land, the temperature drops resulting in snowfall, since cooler air cannot retain much moisture. But what would cause these conditions? The global flood described in Genesis 6-8 would naturally result in the conditions necessary to cause an ice age, as demonstrated by creation scientist Michael Oard. During the flood, “the fountains of the great deep burst open” (Genesis 7:11). This may refer to underwater volcanoes, perhaps nearly all the volcanoes on Earth erupting simultaneously. In any case, the flood was associated with violent tectonic activity. Most creation scientists believe that the continents were connected before the flood into a single landmass which split apart during the Genesis flood. The enormous energy from this geological activity would warm the ocean waters substantially. Second, the volcanic activity would eject aerosols into the Earth’s atmosphere. This would continue to some extent even after the waters from the flood retreated and the land appeared. These aerosols reflect some sunlight back into space. Since less sunlight reaches the continents, they would be cooler than normal. Even today when a major volcano erupts, it results in a temporary reduction in Earth’s temperature. Warm oceans and cool continents are the ideal conditions for the formation of glaciers. The warm ocean water would evaporate, and the moist air would move over the cool land masses. As the air cools, it cannot maintain its moisture, and snow would fall onto the land. In the centuries that followed the global flood, the ice sheets built up over time. The warm oceans along with the aerosols in the atmosphere would have resulted in mild seasons: relatively cool summers and warm winters. Since much of the Earth’s water would be locked up in glaciers, the oceans would have been over 300 feet lower than they are today. This would result in natural land bridges (and ice bridges) between land masses that today are separated by water. This is an important consideration because the descendants of the animals aboard Noah’s ark were dispersing to the various parts of the world. People sometimes ask how the animals got from one continent to another, without realizing that the lower ocean levels would result in natural land and ice bridges. Although the exact timescale is difficult to estimate, most creation scientists believe that the ice age built up for a few centuries after the global flood, and then receded over the next few centuries as geological activity waned. This is significant because it means that certain biblical persons would have lived during the ice age. These include Abraham and Job. Our best estimate places the global flood around the year 2348 B.C. From the information provided in the genealogies in Genesis chapter 11, we know that Abraham was born at least 292 years after the global flood, and hence around the year 2056 B.C. He lived to an age of 175 years (Genesis 25:7). So, Abraham lived at around the time creation scientists estimate to be near the peak of the ice age. Consequently, the climate in the area would have been somewhat different from what it is today. We see an example of this in the account of the separation of Lot’s family from Abraham’s as recorded in Genesis 13. Recall, Lot chose to live in the valley of the Jordon near Sodom, and eventually in Sodom, because it was lush and well-watered everywhere (Genesis 13:10-11). Today, this region is a desert. But during the ice age, the cooler temperatures and mild seasons would have made it the lush land the Bible describes. Although we do not know the precise date when Job lived, most scholars believe that he lived around the same time as Abraham, roughly 2000 B.C. Job’s lifespan of more than 140 and possibly more than 200 years is consistent with the lifespan of human beings at that time. And Job’s wealth is described in terms of livestock rather than silver or gold, which is consistent with the time of Abraham. The text of Job contains some hints that Job indeed lived during the ice age. The book of Job has more references to ice than any other book of the Bible (Job 6:16, 37:10, 38:29). The book of Job also has five references to snow – more than any other book of the Bible (Job 6:16, 9:30, 24:29, 37:6, 38:22). This suggests that Job was very familiar with ice and snow. Job lived in the land of Uz, which we believe to be south of Israel, in the northwest part of Arabia. This area is quite warm today and snow is uncommon. But during the ice age, things would have been different. We have good evidence from science and from the text of Scripture that an ice age occurred shortly after the global flood and as a direct consequence of it. With so much of Earth’s water trapped in glaciers, the ocean levels would have been at least 300 feet lower than today, resulting in land bridges and ice bridges between the continents. This was no accident. It was by the providence of God and helped the animals migrate to the various continents. Hebert, J., Revisiting an Iconic Argument for Milankovitch Climate Forcing, Answers Research Journal 9, September 14, 2016. Oard, M., An Ice Age Caused by the Genesis Flood, ICR, 1990. Specifically, Genesis 11:26 states that Terah was 70 years old when he became the father of Abram (Abraham), Nahor, and Haran. There is some debate as to whether this means all three were born at that time, or merely the first of the three, which may have been Nahor. In the latter view, Abraham was born somewhat later. Job 42:16 states that Job lived an additional 140 years after the events described in the book. Such events include the death of his previous offspring, which were apparently already adults at the time (Job 1:13). So Job may have been 60 years of age or so at the time of his testing. The only other places where this same Hebrew word is used are: Psalm 147:17, Genesis 31:40, Jeremiah 36:30, and Ezekiel 1:22. The other places where the same Hebrew word for snow is used are: Exodus 4:6, Numbers 12:20, 2 Samuel 23:20, 2 Kings 5:27, 1 Chronicles 11:22, Psalm 51:7, 147:16, 148:8, Proverbs 25:13, 26:1, 31:21, Isaiah 1:18, 55:10, Jeremiah 18:14, Lamentations 4:7. However, nearly half of these are figures of speech, such as “white as snow”, rather than a reference to literal snow.